The Diplomat‘s Sanjay Kumar speaks with Indian journalist Rajeev Bhattacharyya about the Indian northeast. The Diplomat’s Sanjay Kumar speaks with journalist Rajeev Bhattacharyya about India’s northeast, including insurgency in the region, relations between northeastern Indian states and the central government, and more. Bhattacharyya recently visited the eastern Indian state of Nagaland where he met with separatist leaders in the region. The interview begins with a description of this journey. 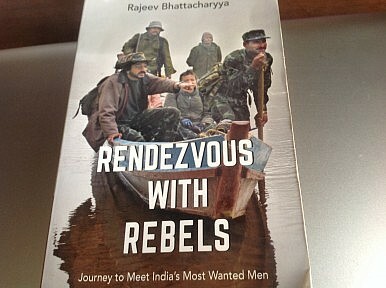 Bhattacharyya is the author of Rendezvous with Rebels: Journey to Meet India’s Most Wanted Men. The Diplomat: What motivated you to take such a long and arduous journey? Bhattacharyya: You see, I returned to Guwahati from Delhi after working there for seven years as a journalist. For the longest time we have been getting media reports about rebel bases in Myanmar. Sometimes the media would report that the rebel leaders have been attacked but very next day the rebels would come out with a statement that nothing has happened. I was keen to know what is the on-the-ground reality, what is actually happening and that is one reason why I wanted to go there as an investigative journalist and took all the risk and pain to go there. I wanted to see the situation first hand. Secondly, I wanted to do something that no one has done before. What I have done is going to a foreign country secretly and meeting the rebel leaders in the jungles–I don’t think something like this has been done before in Indian journalism. I stayed there for four months in the rebel camp, I think no one has done this before. When you visited the camp, what did you see? How was the reality different from what was actually reported? What I saw and observed and assessed there is very different from what was actually coming out in media reports. I came to know that the National Socialist Council of Nagaland (Khaplang) had come to an understanding with the Myanmarese army in 2001. Since 2001, the Myanmarese army has never attacked any rebel base. What I have seen is that both have a very cordial relationship and a very close bond. They have a written agreement. This shows the importance that the Myanmarese government is giving to the Nagas. The NSCN(K) has formed an alliance with other northeastern insurgent groups, like the ULFA, NDBF, and UNLF. Their camps are all in close proximity with each other. There is no question of such camps being destroyed. Once or twice such things have happened, but I would say that they are at peace and there is no possibility of a raid by the Myanmarese army. Whatever has been coming out in the media is extremely false. I give an example: I left home for the journey in 2011 but just before I left there was a report in the media that the ULFA (United Liberation Front of Assam) chief Paresh Barua had been injured in a shelling by the Myanmarese army, but when I reached there I found him hale and hearty. These are all planted news and false stories. Now after coming back I have been able to portray the on-the-ground reality. At least people now believe that what was being planted in the media was absolutely trash and nonsense. What do you make of Paresh Barua? I had a lengthy discussion with Paresh Barua and he has a “never say die” attitude. He is a stubborn man. When I asked him about his organization, he said that the ULFA would revive itself and become stronger in future. But what I assess is that the ground reality is something different. After the split in the ULFA in 2010, after the senior rebel leaders, like Arvind Rajkhowa, surrendered, and others were arrested, the situation for the ULFA has become very precarious. The ULFA is a weakened force. That is why there has been a drastic reduction in the insurgency related violence in the past five or six years, be it in Manipur or Assam. Everywhere there has been a drastic reduction. I understand that the campaign for an independent Northeast by the rebel groups will keep on going but there would now be a different strategy for that, this is what I was able to understand after my interactions with these separatist leaders, including Barua. Do you sense fatigue among the people of the region regarding these insurgent groups? You are right. It is an undeniable reality that fatigue has set in among the people so far as insurgent groups are concerned. There has been a change in the mindset of the people. When you launch militant activities in an area, the entire locality gets affected. Insurgency in the Northeast has been there since 1947, right after India’s independence. So fatigue is bound to set in, people’s mindset has changed. But the fact is that there is a less employment opportunities in the Northeast and now there has been trend that people going all over the country looking for jobs and education. But such mobility does not address the question of alienation of the northeastern people. There is still less emotional attachment with the rest of India for them. Emotional attachment comes at the last and it is where the Indian government has been failing. The Indian government has not still understood the people of the Northeast. Just because there has been a cessation of violence, the government of India thinks that it has won the war against the insurgents. One has to understand that no one becomes an insurgent by choice. No one would like to spend their life in a jungle. There have been multiple reasons that the Northeast has been disturbed, but the Indian government refuses to understand the genuine problem of the region. If the people have stopped supporting the rebels, that does not mean people have started supporting the Indian government. So the attitude of the Indian government has not evolved vis-a-vis the Northeast and its people? The attitude of the Indian government has not changed towards the North East. It still views the region as an imperialist power, hell bent on exploiting the territory. I’ll give you an example: you know, 168 dams are being planned in Arunachal Pradesh: is this a normal thing? This entire zone is hyper sensitive geologically, ecologically, and politically. In this region, you should not promote industrialization. Not every region on earth is meant for industrialization. The government should promote tourism and focus on horticulture and bamboo. This region is a gem of a place for organic food. You don’t need industry here. Indian government should try to understand the region and it should not be bothered by the insurgency. Had the ULFA been so strong then they should have been able to take Assam out of India. Similarly, had the insurgents been so strong then they should have taken Manipur out of India by this time. But this is not the case. Insurgency is seasonal but you have to win the hearts and minds of the people. Try to respect the local culture, promote their way of life. Try to harness local resources. Why did the ceasefire between New Delhi and the NSCN(K) break down? Based on the information I have received, it was a very well planned move by the Khaplang group. In Myanmar, 16-17 insurgent groups have come together to sign a nationwide ceasefire agreement with the government. Khaplang is one of the groups. They saw greater benefits in joining hands with the Myanmarese army. The army has 300,000 troops. The situation in the Kachin region is very tricky. A serious conflict is going on in the Shan province, close to the China border, and the Myanmarese government would not like to open another front with the Naga. Myanmar is a poor country and many children are being taken away for insurgent activities. Even the national army has many child soldiers. It’s poor country and a poor army. Second, Myanmar distrusts the Indian government. It will have a greater degree of friendship with the NSCN(K) rather than accepting Indian government requests for eliminating these camps. These areas of the country, in the Upper Sagain division, are still no man’s land. There is no presence of the Myanmarese government or army there. But Khaplang has accepted the authorities of the Myanmarese government. There has been an agreement between these two and this is a big achievement for both of them. This means that all the separatist outfits staying under Khaplang in the territory are safe. The question is can the Naga outfit or other insurgent groups escalate conflict in India for a separate land? I dont think this will happen in the near future. Their strategy has changed. When I spoke to some of the leaders in the jungles, they told me that they are banking heavily on China. Chinese involvement with these groups is much greater than what the Indian government can think of. This I mention in my book. What can China’s interests be in supporting these rebel groups? China has been employing some of these groups for spying activities. Now you never know. China is a very unpredictable neighbor. For Beijing, Myanmar is very important. What Bhutan is to India, Myanmar is to China. The communist regime has commercial and strategic interests in Myanmar. It has already got two pipelines from the Arakan region to Yunnan province in China. Now, in the last few years, the situation in Myanmar has changed and China feels that its grip over Myanmar is loosening a bit. Earlier, the Myanmarese government was quite close to China now it is getting closer to the United States and European countries. This development China does not like. Also, earlier the Kachin Independence Army was pro-China, but very recently, a huge hydroelectric dam project, which China was supposed to build on the Irrawaddy river, was cancelled by the Myanmarese government because of local protests. So Beijing feels that it needs to cultivate more insurgent groups. I can say with certainty that China has been trying to cultivate a greater relationship with these insurgent groups so that it can have better hold over Myanmar’s Sagaing region. The Indian government is coming under criticism for the opacity with which it concluded a recent peace agreement.